Flying during the holidays is typically frustrating at best, and even worse if you’re travelling to or from anywhere that snows. So to help alleviate a tiny bit of stress, Google is adding its flight delay predictions feature to the Google Assistant. That means starting this holiday season, you should be able to ask the Google Assistant if your flight is on time and get a response showing the status of your flight, the length of a delay (if there is one), and even the cause (assuming that info is available). “Over the next few weeks,” Google says its flight delay predictor will also start notifying you in cases where its system is 85 per cent confident, which is deduced by looking at data from past flight records and combining that with a bit a machine learning smarts to determine if your flight might be late. That leaves some room for error, so it’s also important to note that even when Google predicts that your flight is delayed, it may still recommend for you to show up to the airport normally. Still, in the space of a year, Google seems to have upped its confidence threshold for predicted delays from 80 to 85 per cent, which ain’t nothing. We’ve reached out to Google for more specific info on how the company has improved its predictions for users, but have yet to hear back. 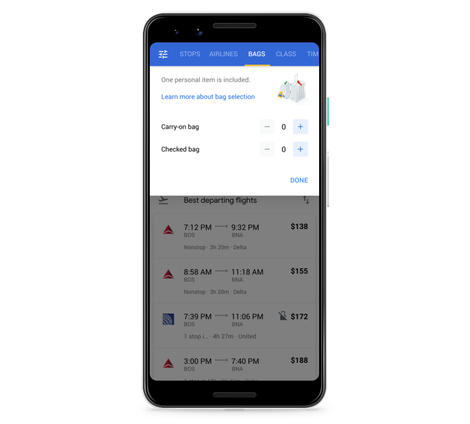 Looking past the holidays, Google also says it’s improving a few tools to help you plan your next trip. In Google Maps, the company has added suggestions in the Explore tab to give you some ideas on places to go.